It has now been a week since we last spoke about my desperate desire for a Hollywood Regency Brass Dome Lamp. For those of you who got on the bandwagon and decided you were also in desperate need for Brass Dome lighting, look no further. Here she is. In all of her glory! My Ikea hack of the Brasa Table Lamp. You all that follow on Twitter are perfectly aware of what I was up to. Again, thank you for the vote of confidence. Now. Let me first start by saying, this is not even close to her new home. Not even. I am just trying to give a very basic idea of what she would look like in a semi-stylized area. Later, we will get to her actual, current residence. In the ghetto of the house. Where all decorative items go to die until our departure. The dining room table. Chic, people. That is what that is. We keep it strictly chic around here. So here is where you can get this lovely thang. Her cord even got a paint job. And the man that made her the woman she is today. My one true love. He never lets me down. The man who makes it appear as though King Midas has struck down on our house time and time again. 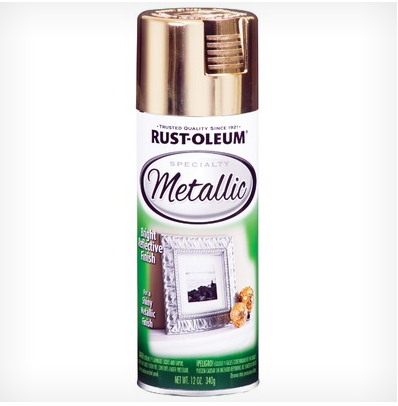 My Metallic Gold Spray Paint. Another shot of the lamp in a somewhat stylized area. It is one of the only areas of our house that has not yet been infiltrated. And in her actual home. Can we say glamorous? Tres chic, Linz. Hey, I am keeping it real. I cannot wait to show this brass dome lamp off in her new home, my office. Can you imagine?!! It is going to reside on my new white Parsons desk. She is definitely going to steal the show. I honestly am more pleased with her than I would be with an actual vintage piece. No offense. This lamp has an enormous, oversized dome which makes it even more dramatic. We all know, I love the drama. Love it! I am seriously addicted to thar spray paint! Awesome! It looks great! I'm the spray paint queen! When I lived in an apartment my neighbors hated me because I was always spray painting something or another on my front stoop, stinking the whole joint up with fumes! LOVE gold spray paint and the lamp looks perfect! Freaking love it! Genuis transformation. I love me a good can of spray paint too, I tell you spray paint makes miracles happen! Well done! It looks super awesome! Just may have to make one! Oh I love it! I just sprayed a lamp gold too and I can't get enough of it. It will look so great on your parsons desk. I share you unfailing love for gold spray paint- everything is better in gold and well...that lamp of yours...HEAVEN!!! Oh my lord this looks so amazing!!! I am totally keeping this idea in mind when I need a table lamp. So glorious! Well done. GAH! Now all I need is an Ikea.... Looks fab! This is awesome! What a great update! Great hack and I agree, better than the real deal for size alone!!! Love it! I did the same thing with that spray paint on the inside of my black lamp shades. Is there anything that wouldn't look better with a little gold metallic? I don't think so! Your lamp looks really great! I'm doing a DIY post in the next few days and I'm going to have to mention this. Also, my daughter wants me to spray an old pair of cowboy boots gold for a "Wild Western" party this weekend. I think I'll try this paint! I love it! Perfect shape and color! I am so stealing this! Seriously, though, the lamp makeover is gorgeous. Very high end looking! 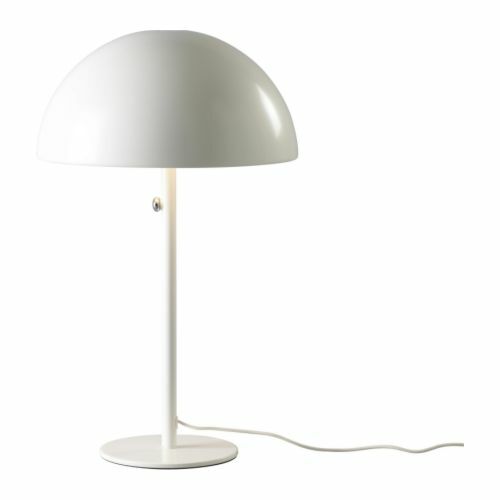 Why does an IKEA lamp have to be $80, though? Doh.